Dear Mom: Happy Birthday! You are not forgotten by me just because I’m tramping in the Wilds. I love you! This morning I awoke at 5:25 AM not very eager to emerge from the fancy multi-thousand count Egyptian cotton sheets at the Park City hotel generously comp’d to me by one of my consulting clients. But here I am at 11 PM tucked into my Katabatic Chisos quilt (14 oz!) at 11,172 feet in elevation at the spectacular Cleveland Lake in the High Uintas Wilderness. This is Day 1 of a 9-day, 50 or 60 mile expedition where we are attempting a high route, off-trail circumnavigation of the Rock Creek drainage. We left the Rock Creek trailhead this morning to overcast skies, carrying only the essentials needed for a day hike. We left our packs with Alesha Williams who would bring them up on horses to Cleveland Pass and leave them for us. If you are looking for an outfitter in this area, give her a call at Flying J Outfitters. She inherited the business from her grandfather and she knows what she’s doing. She took care of us with exceptional service! Our “day hiking” gear consisted of water treatment (Aqua Mira), a 1-liter Platypus, snacks, cameras, and a rain jacket each. Chase carried his in a RIBZ pack. I used a custom RIBZ made with Cuben Fiber. Dan took the top lid from his Spectra SARC, and Eden and Mike shared a ZPacks Blast 1800. Intermittent rain with dropping temperatures greeted us as we gained more than 3,000 feet of elevation over the course of the 12+ miles to Cleveland Pass. Upon our arrival, well after 7 PM, we were pretty bushed. Short nights of sleep leading up to the trek combined with a cold hike, snacks that ran out early, and the short breath that comes with trekking above 10,000 feet on the first day combined for a bit of exhaustion upon our arrival to camp. Cleveland Pass is a massive expanse of relatively flat tundra highland. The pass itself is gentle and wide. The peaks around it are not much higher than the pass itself. On our way up, we saw elk, heard the chirp of marmots, and followed huge, 3-foot tall cairns when the trail went away. We are pitched in a beautiful tundra meadow overlooking the lake with a tiny stand of subalpine trees nearby for a cooking area that offers some shelter during the rain. Dinner was an after-dark sort of affair but delicious nonetheless and we were appreciative of the hot food after a long day. Our seven Spectra-cloth Ursacks are stuffed to the gills with our food bound up inside odor barrier bags. They are tied securely to the trunks of small trees so the errant bear or perhaps a muscular marmot does not tote them away. As darkness turned darker, we retired to our shelters for a much needed sleep. Chase in a Locus Gear Cuben Khufu, me under a Hyperlite Mountain Gear Cuben square tarp, and the rest split between a pair of Hyperlite Mountain Gear Ultamid 4’s. Lots of Cuben Fiber at this camp! I’m reminded that the total weight of our four spacious shelters is less than the weight of my first 2-man North Face backpacking tent, purchased in 1986. And, they collectively offer 7 to 8 times more living space than that tiny little claustrophobic heap of nylon. Good riddance. The clouds have moved on towards the horizon and are replaced by a wet drizzly fog. The moon and bright stars of the Big Dipper are shining hazily through, giving me hope for warmer and drier weather tomorrow. 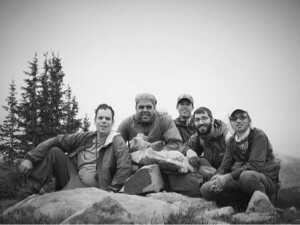 Photo: Evening portrait at the Cleveland Pass cairn. // Follow and Enjoy the High Uinta Wilderness!